You are currently browsing the tag archive for the ‘John Dunn’ tag. 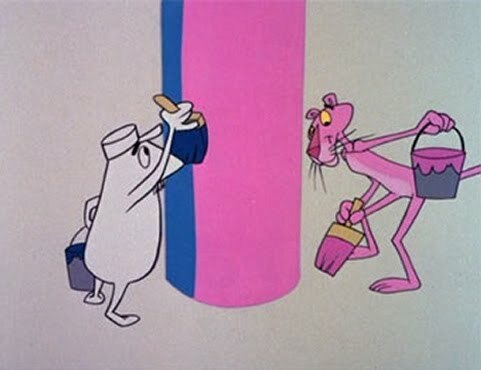 In his very first own short The Pink Panther nags a painter by painting everything pink that the painter just has painted blue. This is the Pink Panther’s first film, and it’s easily one of his best. Its simple idea is worked out perfectly into a tight plot (by John Dunn) with a grand finale. Its pantomime animation is effective and its sober design supporting. Although he never got a name, the “little guy”, the white, big-nosed, mustached antagonist, who resembles both his creator, Friz Freleng, and Inspector Clouseau, is very important to the success of the series: he is easily the best designed opponent in the Pink Panther cartoons. Like the Pink Panther he’s monochrome, and a silent character, allowing the animators to make the best out of pantomime animation. Moreover, he could be staged in all kinds of functions and settings. Nevertheless, he kept a consistent character, being normally kind and gentle, but getting puzzled, then frustrated and often in the end, very angry with the Pink Panther’s antics. Nevertheless, it took the makers a while to realize his potential, for though the little guy would return as a janitor in ‘We Give Pink Stamps’ (1965), he would only become a regular from ‘The Pink Blue Print‘ (1966) on, after twenty films with other, often talking, and always less wonderfully designed characters.